Defend in a Deep Lying Block Defense – Aerobic Power. Defend in a Deep Lying Block Defense – Aerobic Power. The following activity coaches a team to defend in a deep lying block defense. The specific fitness target is transient endurance while adapting the player’s aerobic power in an extended small-sided format. When preparing the activity, if needed, concentration and difficulty levels may be increased by having players execute something extra unique by setting more restrictions. Every activity may be modified, and it is up to the coach to be creative. However, it is important to respect the parameters of the exercise time, the rest, the types of actions used and the weekly periodization of the activity. Additionally, it is beneficial to train a soccer team and its players with all the elements of the game being present in the session. By doing so, it will promote soccer specific adaptations to the player’s body, mind and emotional triad. Ultimately, these adjustments will enhance their real-time game performances on a physical, emotional, conscious, and subconscious mental level. Total Activity Time: 20 Minutes. Intervals: 3. Activity Time: 6 minutes. Recovery Interval Time between Sets: 1 minute. • Tactical: Defend as a team in a deep lying block defense. Defensive individual, small group and team collective defending principles of play. • Fitness: Aerobic Power. Ability to play through three repetitions at a high rate. • Technique: Proper fitness and off/on the ball execution/techniques. • Mental-Emotional: Players fully engaged and concentration is high. 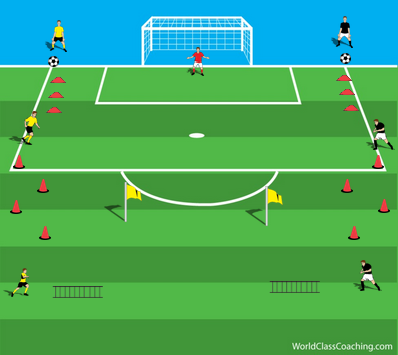 • Yellow team (4-4-1) trains to defend in a low-lying compact box shape. • There are three goals (6 yds.) placed at the yellow teams end line. • A Target player is located at the black team’s end line and may only run side to side on the line. • A line of confrontation is located 30 yds. from the yellow teams end line. • Yellow team may not defend beyond the line of confrontation. • Black team (4-2-3) starts with the ball and looks to score through one of the three goals by either passing or dribbling through it. • Yellow team looks to defend the three goals. • If the defending yellow team wins back the ball, they look to transition into attack and find the target player. They may go beyond their line of confrontation when in possession. 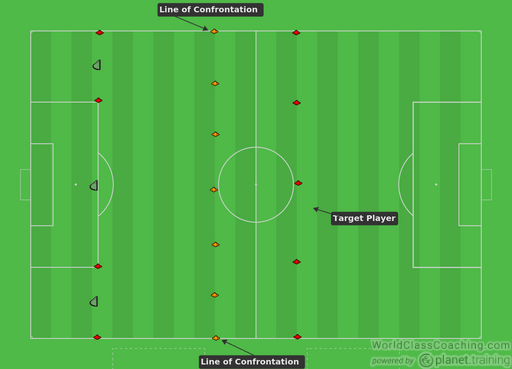 • Once they find the target player, the teams quickly recover below the line of confrontation and begins to defend again. • Target player plays with black team during possession and is available to receive passes from yellow team when they are in possession. • Defending team works collectively to protect three goals. • Collective shifting and understanding of roles in zones. • Pressure, Cover and Balance concepts. • Team yellow recovers into a deep lying defensive shape after a turn over to the Target player or when taken away by the defending team. This game is focused on developing players’ capacity to recover quick bursts. The quicker energy stores will be refuelled, the more intense actions can be produced early. These outcomes are achieved within highly engaging 4v4 games scenario which improve players’ decision making, wide range of technical abilities as well as working as a team. It also challenges players’ concentration and dealing with pressure as the game finishes if one of the teams scores! Organise 30 x 45 yards pitch with two goals as shown on the diagram below. Assign goalkeepers to goals. Divide the team into two groups of eight. Then further divide the groups into two teams of four. First two groups start on the pitch, the other two wait on the side of the goals. Prepare a sufficient supply of balls in goals. The practice starts with one of the goalkeepers playing the ball out into the attacking team. Then, the game continues with both teams trying to score in the opposite goals. No corners apply – the game is restarted from the goalkeeper. The game continues until one of the teams score a first goal. The pitch is relatively long for this format so direct play and quick combinations should be encouraged. Both teams come off the pitch when the first goal is scored. The team that scored it gets 1 point. As soon as the goal is scored and two teams come off the pitch, the next two come onto it straight away and the game continuous with new 4v4s. Points from both teams get accumulated and the final score decides the winner. Each team should complete 6-10 repetitions (min. 12 games) in 2 series. Rest between repetitions should be 1-3 minutes and between series – 4 minutes. The following practice is aimed at developing the ability to sustain many actions throughout the whole match. In example, that will enable players to produce the same amount of sprints in the first as well as last 15 minutes of the game. In addition, that is achieved in possession game, what increases the motivation of the players and links physical focus with technical and tactical content. Set up a square of 30-40 m. depending on the ability as well as number of players. Organise min. 6 little gates in the middle of the square as shown on the diagram. Divide the group into two teams of 5 players. To score a point, a team should pass the ball through a small gate. The team with more points wins the game. Team competitions are always fun. They demand each player to work to their maximum effort as they represent their team. This technical relay race will focus on techniques of dribbling the ball and ends with the player shooting. The exercise is set up as shown below. We have 3 players representing each team, Yellow and Black. Player one begins at the end line of the field, with a ball at his feet. Player one has a line of small cones in front of him. Player two waits behind the tall cones, which are placed in a zig-zag formation, diagonal from each other. Player three waits behind a ladder; this is the player that will finish the relay by taking a shot. Player one will complete his station before passing the ball to the player at station two, who in turn completes his station and passes to player three; who completes his station beats the flag and takes a shot to finish.